Pressenza publishes here the full text of the statement issued by President Trump of the USA and Chairman Kim of North Korea. President Trump and Chairman Kim Jong-un conducted a comprehensive, in-depth, and sincere exchange of opinions on the issues related to the establishment of new U.S.-DPRK relations and the building of a lasting and robust peace regime on the Korean Peninsula. President Trump committed to provide security guarantees to the DPRK, and Chairman Kim Jong-un reaffirmed his firm and unwavering commitment to complete denuclearization of the Korean Peninsula. 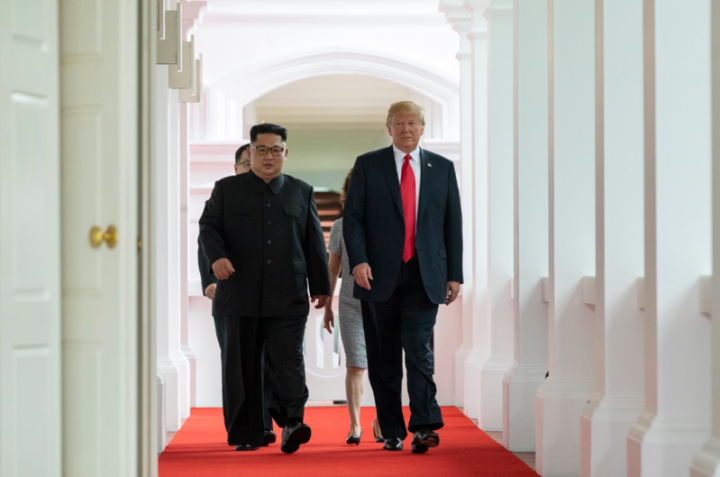 Having acknowledged that the U.S.-DPRK summit — the first in history — was an epochal event of great significance and overcoming decades of tensions and hostilities between the two countries and for the opening of a new future, President Trump and Chairman Kim Jong-un commit to implement the stipulations in this joint statement fully and expeditiously. The United States and the DPRK commit to hold follow-on negotiations led by the U.S. Secretary of State, Mike Pompeo, and a relevant high-level DPRK official, at the earliest possible date, to implement the outcomes of the U.S.-DPRK summit. President Donald J. Trump of the United States of America and Chairman Kim Jong-un of the State Affairs Commission of the Democratic People’s Republic of Korea have committed to cooperate for the development of new U.S.-DPRK relations and for the promotion of peace, prosperity, and security of the Korean Peninsula and of the world.